music / Rendezvous / sacramento / Shows / Things to do / Words. The Devil Makes Three has come a long way from home. On February 7, that road will lead the Santa Cruz-based band to Ace of Spades in Sacramento. 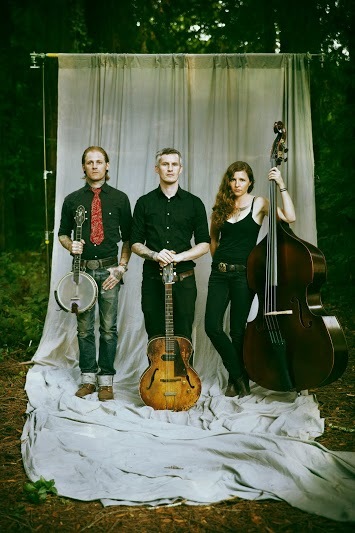 The three-piece bluegrass/rock band—made up of Bernhard, upright bassist Lucia Turino and guitarist/banjo player Cooper McBean—released their fourth album, I’m a Stranger Here, last October. It’s their first album with indie label New West Records, and they’ve been on the road touring since its release. The three members of TDM3 all grew up near Battleboro, Vermont, and were each raised in families with rich appreciation for folk and blues. In their younger years they traveled to Boston in search of punk shows. While Bernhard and McBean have played music for decades, Turno learned upright bass to join the band, and they formed The Devil Makes Three over a decade ago in Santa Cruz. Their old-time sound conjures up nostalgia for a simple and more-self-sufficient time, a reflection of the band’s roots and work ethic. “We started out 100% DIY and would not be where we are now without the help of tons of DIY promoters and fans,” Bernhard said. The band blends “garage-y ragtime, punkified blues, old n’ new timey,” with country and some gospel thrown in for good measure. “We bend genres pretty hard,” Bernhard said. Their latest album is largely inspired by life lived mostly on the road, an experience they consider a blessing and a curse. “We get to do what we love, (but) it can feel like a curse sometimes to never get a chance to be at home,” Bernhard said. Their touring has taken them onstage at San Francisco’s Hardly Strictly Bluegrass Festival, Bonnaroo, Lollapalooza and Austin City Limits and tours with Willie Nelson and Trampled by Turtles. Some of the most musically inspirational places to Bernhard include New Orleans and Sun Studios in Memphis. “The more you travel the more stories you accumulate and I think that comes out on this record,” he said. Many of their songs also feature biblical and gospel elements, notably “Help Yourself” (off Do Wrong Right, 2009), and “Hallelu” off their latest album. The song “Stranger” kicks the record off with an eerie, gospel feel and the final song “Goodbye Old Friend” closes it with a similar but slower sound. “I think every song should tell a story and … I always try to show the listener rather than tell them. … I love a good story,” Bernhard said. If you get a chance to enjoy a boot-stompin’ good time with The Devil Makes Three on February 7, you will leave with a story to tell. Get tickets to the Feb. 7 Ace of Spaces show with The Brothers Comatose at the Ace of Spades website. Check out The Devil Makes Three, buy their latest album and see their video for “Stranger” on their website. Tags: Ace of Spades, ace of spades concerts, Austin City Limits, Battleboro, bluegrass, Bonnaroo, concerts, Cooper McBean, DIY, Hardly Strictly Bluegrass Festival, live music, Lollapalooza, Lucia Turino, Music, New West Records, Pete Bernhard, Santa Cruz, TDM3, The Brothers Comatose, The Devil Makes Three, The Devil Makes Three ace of spades, The Devil Makes Three tour, Trampled by Turtles, travel, Willie Nelson. Bookmark the permalink. Previous post ← Stream Morgan Delt’s self titled album out January 28th.